Yesterday, in a Twitter conversation about the romance community and its actual, or perceived insularity – one thing led to another, as they are wont to do on Twitter – and Miss Bates ended up posing the question: “How old were you when you read your first romance? Name it, please. She really likes lists.” Miss Bates is grateful to all respondents who shared memories of that one book, or author that/who sparked their love of the genre. What was interesting to Miss Bates wasn’t solely the titles and authors, the ages more so, the stories around them and the effect, impressions, and responses the romances elicited in their readers. These books, in the life of the reader, were threshold books, no matter how humble the category romance now dead to all except the squeal of the find at a church bazaar, books that led and guided romance readers to the genre. What emerged, from what is only anecdotal evidence, is that these spirit-guide books are sometimes Poohs to our Christopher Robin. Many romance readers/tweeters read their first romance, though by no means all, at twelve, or thirteen, that important moment in a girl’s life when she’s tasted a bit of independence. Her body is strong; her mind, acute. But changes are on the horizon: she’s a filly nosing the spring air: something is coming, something new. A burgeoning sexual self, a budding and newer awareness of her identify. The blessings of being a reader (please read to your kids, parents, please take them to libraries and bookstores and let them explore and choose books) is that we can rehearse and muse and consider so many lives between the pages of a book. Miss Bates cannot speak for her fellow-tweeps: why that book? What did she get out of it? We most surely bring so many things to our reading of a narrative. Miss Bates speculates that sexual curiosity may have led us to the romance novel. But it’s not the sole reason we read romance: the need to redefine how we negotiate relationships, relationships+: not family, not friendship, but the seeds of what we’d later understand as “cleaving,” to use an old-fashioned term, the physical and emotional attachment to The Other, daunting, exciting, and necessary. Some time in the late 90s, Miss Bates saw a film she hasn’t forgotten, much as she’d like to. It was bleak, depressing, definitely anti-romance. In it, the heroine had opportunities to save herself, to achieve an HEA. She was so passive, so unable to accept help from the people she encountered that she perished needlessly. The film is Amos Kollek’s Sue: Lost In Manhattan (it’s available, in its entirety, on YouTube, if you’re so inclined). What does this bleak portrait, in the centre of which is an anti-heroine with a strangely compelling passivity, have to do with Molly O’Keefe’s Indecent Proposal? Miss Bates couldn’t help but recall the film as she read O’Keefe’s final book in her Boys of Bishop series. Kollek’s Sue is unemployed, evicted, and meanders through Manhattan looking ethereally, cadaverously beautiful. She worked as a temp and has a degree in psychology. She’s friendless and without family. She cleans up well and is intelligent and soft-spoken. Sue carries a defeated look, her eyes say “I’ve lost even before I’ve begun.” She meets a wonderful friend (actually, she’s a bartender!) and a beautiful man: the friend wants to help her, the man to care for her. She doesn’t reject them: she’s so tired of life she doesn’t call on them. Finally, a lovely Loveswept cover (no waxy mannequins)! Carina’s covers for Barry’s series have been great! 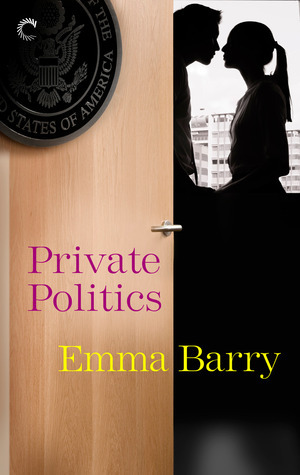 Near the end of Emma Barry’s Private Politics, second title in The Easy Part series, protagonists Liam Nussbaum and Alyse Philips work together on a news story. Liam, owner and editor of a successful political blog, Poindexter, refers to working with Alyse as being “very His Girl Friday.” At that moment, it clicked for Miss Bates. Barry’s second Washington D.C.-set romance novel about the byzantine wheeling and dealing of America’s capital echoes 1930s screwball comedies (which also happen to be Miss B’s film favourites). She was disposed to like Private Politics on this basis alone, but found so much more. While the obvious connection, given the journalistic and political context, is Hawks’ His Girl Friday, Miss Bates found parallels to Capra’s It Happened One Night, with its journalist-hero and rich-girl heroine and themes of professional integrity and disclosure wrapped in a cross-class road romance. While Private Politics contains only a hint of the cross-class element (indeed, Miss Bates loved the cross-religious element to the romance; Liam, middle-class nominal Jew, and Alyse, self-avowed rich-girl, Manhattan-ite WASP), Liam and Alyse journey, though they never hit the road, by navigating the personalities, complexities, and immoral/amoral machinations that people America’s capital. 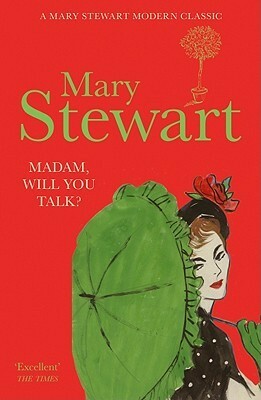 The “Beginning of a Beautiful Friendship”: Mary Stewart’s MADAM, WILL YOU TALK? Love these Hodder & Stoughton re-issue covers. 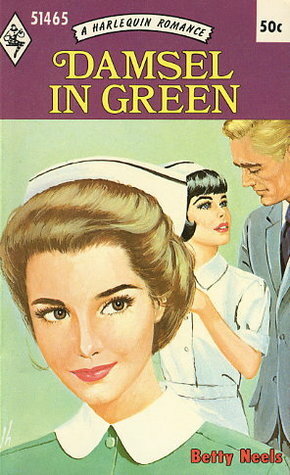 Weird cover: what’s with the “rival” nurse? Not in book, Harlequin. As you know and may be tired of hearing, Miss Bates is revising and renewing her blogging project without straying too far from her original purpose. One way she’s done so is by reading outside her romance comfort zone, tackling a Big Fat Book over the summer (Hilary Mantel’s Wolf Hall, which she’s enjoying more than she expected to). At the same time, she’s revivifying her blog by writing about romance beyond the review (rest assured she’ll still review romance). In her previous post, she considered the idea of romance reading as panacea, as a comfort zone in the daily grind, when “troubles come not single spies, but in battalias,” as Claudius says to Gertrude in Shakespeare’s Hamlet. Romance reading, however, doesn’t happen solely as an escape, or coping strategy. Romance is read for comfort, but it’s also read for pleasure. Miss Bates offers this eloquent summary of what she’s been trying to say about romance, which she found quoted in the Mary Burchell Wikipedia article (thanks to a Twitter convo with Sunita). Burchell, one of the founders of the Romance Novelists’ Association, wrote in one of their newsletters, ” … a good romantic novel is a heart-warming thing which strikes a responsive chord in those who are happy and offers a certain lifting of the spirits to those who are not.” There is one writer, at least for Miss Bates, who exemplifies Burchell’s point: the Immortal, Inimitable Betty Neels. About a month ago, Miss Bates, stuck in afternoon traffic, listened to a favourite CBC Radio podcast, Tapestry, a show that self-describes as offering “the more subtle news of life – a thoughtful consideration of what it means to be human.” Their motto is Kant’s “The human heart refuses to believe in a universe without purpose” (which is also a darn good motto for the romance genre). One segment of that particular podcast was “The Novel Cure,” an interview with Ella Berthoud and Susan Elderkin who run Bibliotherapy at The School of Life in London, England, and have published a book called The Novel Cure: An A-Z of Literary Remedies. What a great idea, thought Miss Bates, a book recommendation for what ails you: feeling blue, out of sorts, plain pissed off, or having the “mean reds” as Holly Golightly said. Have you been dumped, are about to embark on a voyage, be married, divorced, change jobs, or cities? Berthoud and Elderkin’s prescribed book eases the transition, comforts, and diverts. Books as “prescription” medicine for the under-the-weather soul, mind, and heart. She listened, rapt, as Berthoud and Elderkin suggested titles for a variety of moods and circumstances: H. E. Bates’s The Darling Buds Of May for cynicism; Nick Hornby’s High Fidelity for a recent break-up; Antoine de Saint-Exupéry’s Night Flight for fear of flying; and, Cormac McCarthy’s The Road for a new father. Miss Bates considered their choices lugubrious. Blatty’s The Exorcist for a loss of faith!? She’s read de Saint-Exupéry’s Vol de nuit and there’s nothing in it to comfort someone who’s afraid to fly (especially in light of de Saint-Exupéry’s night flight disappearance during WWII). What cheer is there for a new dad in the post-apocalyptic world of The Road? Great books all, but do they comfort and divert? They are intelligent, well-written, and challenging; they offer answers and considerations. They are great choices, BUT! Miss Bates protested WHERE ARE THE ROMANCE NOVELS? Do they not offer comfort, diversion, and thought to feeling blue, turning green, and seeing red? To despair, uncertainty, ennui, malaise? On the occasion of birth, death, and everything in between? Don’t they have a place in the prescriptive canon? At Ros Clarke‘s instigation and inspiration, Miss Bates joined her and others in reading a BIG FAT BOOK in July. Lately, Miss Bates reads romance restlessly, ARC after ARC, writing reviews … it feels flat, too much of the same for too long. She had difficulty articulating her malaise until she read this latest post by Jessica of Read React Review. Jessica is forthcoming about her own blogging and reviewing blehs-mehs. When Jessica didn’t feel the blogging love anymore, when blogging was a chore and burden, she put her blog on hiatus. Miss B. missed her terribly, but she understood. Then, Jessica returned, to all our joy! It was enlightening and comforting for Miss Bates to read Jessica’s blogging take because it’s positive, helpful, and hopeful. In a nutshell, blogging blahs happen: don’t feel guilty, take a break, make some changes; you will blog again and enjoy it. Your blog is bigger than you: let it brood while you brood. Miss Bates knows that she would miss MBRR terribly, so it’s not a hiatus she needs.